Chicago's Deeply Rooted Dance Theater (DRDT) celebrates its past and seeds its future with its Summer Dance Intensive and Emerging Choreographers Showcase in July and the 20th anniversary season finale performances in December, featuring a premiere by South African choreographer Fana Tshabalala. Deeply Rooted conducts its annual Summer Dance Intensive for 70 national and international students on June 26–July 22 at its resident studio in downtown Chicago. This year, DRDT launches a satellite program in partnership with The Chicago Park District, offering technical training and artistic development in the culturally underserved West Pullman Park community. Participants will experience a rigorous curriculum fostering learning and personal growth, along with opportunities to experience the company’s repertoire through workshops and performances. The Emerging Choreographer Showcase, an advanced division of the Summer Intensive, provides an environment for up-and-coming choreographers and dancers to cultivate creativity, deepen technical skill and gain performance experience. The program concludes with performances on July 21 and 22 at the Reva and David Logan Center for the Arts in Hyde Park. South African choreographer Fana Tshabalala completes a three-week residency with DRDT in July to create an American/Chicago-focused adaptation of his work INDUMBA. Originally created to illuminate the spiritual impact of unresolved apartheid politics in his native South Africa, Tshabalala is adapting the work for an American audience. “Indumba” means African healing hut, promising a work of stirring resilience and reconciliation. Deeply Rooted premieres the new incarnation of INDUMBA at its 20th anniversary season finale performances, Deeply Free, on December 8–10 at the Reva and David Logan Center for the Arts in Hyde Park. The program will also feature company classics such as Church of Nations, Desire, Surrender and more. For those interested in a behind-the-scenes look at the choreographic process, DRDT presents a preview of the new version of INDUMBA on July 27–29 at West Pullman Park. DRDT embarks upon its next 20 years when it presents Looking to the Future on February 24, 2018 at the North Shore Center for the Performing Arts in Skokie. The program features the premiere of Alice by DRDT company member Nicole Clarke-Springer and other works from the repertoire. Founded in 1995, DRDT is rooted in traditions of African-American dance and storytelling. For more information, visit www.deeplyrooteddancetheater.org. 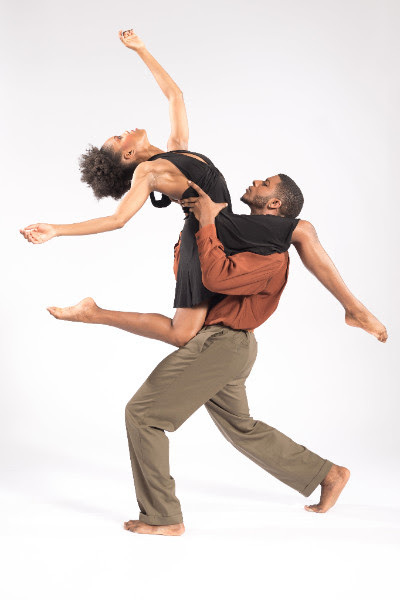 Photo: Deeply Rooted Dance Theater’s Paige Frazier and Joshua Henry. Photo by Ken Carl.